Queso blanco from the new Mexican greengrocer on St. Nicholas Ave.
Halve avocados and scoop out some but not all of their flesh. Roughly chop and toss with black beans, queso blanco, cilantro, chopped tomatillos and lime juice. 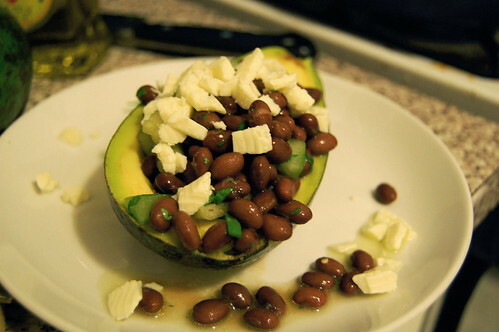 Serve in the meaty avocado shells. Wow. That looks fantastic. I’m going to try this on the husband. New Mexican greengrocer, you say? Where on St. Nick is it? Katie: St. Nicholas near… 187th-ish? It’s on the southwest corner of the intersection, green awning, says Four Star on it —— might be 188th, actually. It’s not that big, and there are several other stores nearby with much bigger selections of Mexican produce/groceries, but the guy behind counter at Four Star is really nice. Wow! What a blog. You have a real knack for making a blog readable and easy on the eyes. I can’t wait to try out some of the recipes you have here (after a trip to the market to get the ingredients). Cooking is one of my favorite things. I love improvising in the kitchen. I don’t have time to read all the articles on your site right now, I found your site while I was looking for something else on Yahoo, but I’ve bookmarked your home page and will check back soon to see the latest recipes. Please bookmark my recipe web site at http://www.KAChef.com. Keep up the great work, and have a great weekend!